Looky what showed up here at work today. 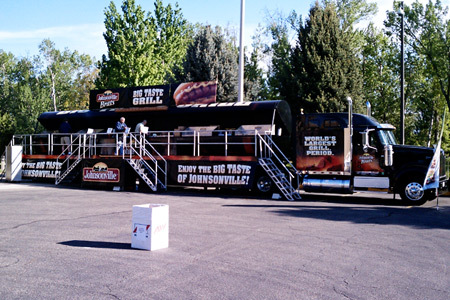 Daddio hit some brats from the Johnsonville® Big Taste Grill. That thing is a monster! 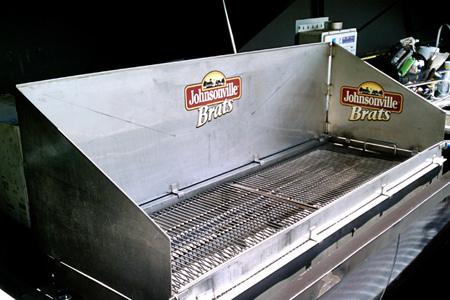 This bad boy houses six independent gas grills that can hold about 100 sausages each. 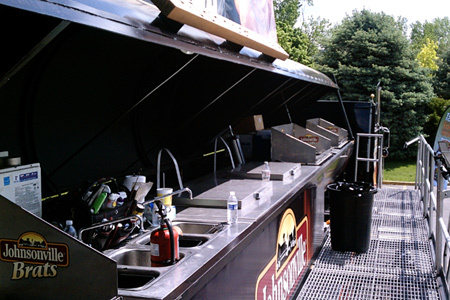 They only used two grills today, but they use them all for large venues like car races. After being served my lunch I took a few minutes to talk to the cook just as he was finishing his clean-up. I was really impressed with how clean they keep those grills. Oh, and the brats were good! The only topping required is a little mustard, of course. Ha! There are three of them that cover various parts of the country. The one here was headed to Portland, Oregon next. I think the one you saw is in Little Rock this weekend. Dang it, I missed it! A lot of different mustard's out there these days, what kinds did they offer with their brats? I'm always on the look out for the perfect mustard. All we had was plain yellow mustard, which was fine.